Downton Abbey meets World War I and the Russian Revolution in Ken Follett’s Fall of Giants. Follett is one of my favourite historical fiction authors – if you enjoy historical fiction, you must read his international bestseller Pillars of the Earth and its sequel, World Without End. Fall of Giants is the first instalment of Follett’s Century trilogy, in which he plans to follow the lives of five families over 100 years. There’s Lord Fitzherbert and his sister Lady Maud, their housekeeper Ethel Williams and her brother coalminer Billy, German spy Walter von Ulrich, Amercian presidential advisor Gus Dewar and orphaned Russian brothers Grigori and Lev Peshkov. Follett takes us from the homes of the British aristocracy to the coal mines of Wales, from the battlefields of World War I to the frontline of the Russian Revolution, from the corridors of power to hunger on the streets. He covers life, love and politics, giving us an insight into tensions and changing dynamics between the aristocracy and working classes as well as the fight for women’s rights. Follett has undertaken meticulous research and attention to detail, giving the reader an insight into everyday life at the time – what people wore, how they spoke and etiquette of the day right down to the type of artillery used in war. Be warned – Fall of Giants is a hefty 850 pages and there is a lot of political manoeuvring and military strategy to keep track of. But Follett creates lovable (and not so likable) characters, sweeping the reader into their life stories as they navigate their way through the horror and politics of war. 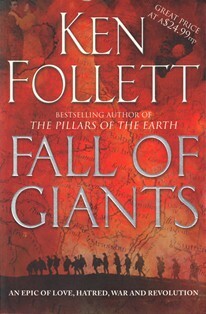 Would you like to read Fall of Giants by Ken Follett?